For and about the advancement of Chicago art. 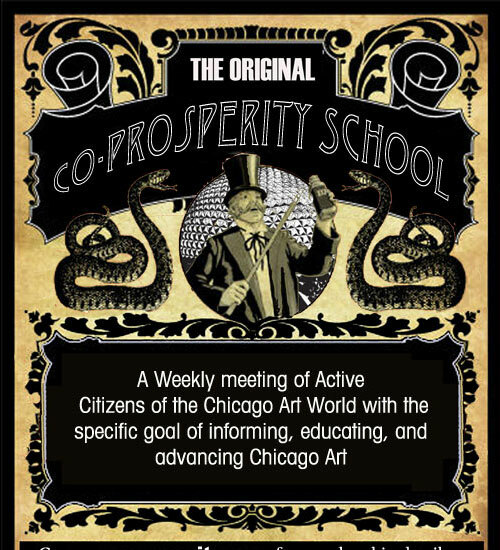 The Co-Prosperity School is an Artist-Run School that has met regularly at the Co-Prosperity Sphere since 2010. We run frequent 8-10 week sessions. Participants find a place where intelligent dialogue on art takes place. Some find new tools to help their career. Others form friendships. The class also offers people a space to discuss what is currently happening art-wise in Chicago. Best of all we think participants are pleased to meet the people that shape the contours of our art ecology. We think the school is successful in that it allows us to describe what an art world looks like, creates an engaged and informed community, and lets us peek into the minds of some local/international art heroes and villains. Our School is geared towards artists who have graduated from art school and are now making work outside that support system. Our format is also a reaction against the continuing education institution, the post (or non) MFA education. Aaron Delehanty, Ahmed Ozsever, Anthony Bowers, Ariel Radock, Arturo Evening, Basia Toczydlowska, Ben Noetzel, Brian Keane, Bryn McCoy, Cassie Hamrick, Chad Huggins, Christopher Wood, Clarisse Perrette, Jessica Cochran, Daniel Schor, Deirdre Colgan, Ed Marszewski, Elizabeth Burke-Dain, Georgina Ruff, Hui-min Tsen, J. Byrnes, Jason Robinette, Jeffrey Geesa, Jenny Buffington, Jeriah Hildwine, Jessica Harvey, Johannah Silva, Jordan Martins, Kristina Tendilla, Laura Elayne Miller, Laura Shaeffer, Lauren M. Pacheco, Madeleine Bailey, Marian Frost, Mary Ayling, Pat Elifritz, Ray Emerick, Regina Mamou, Ryan Peter Miller, Stephanie Burke, Teresa Silva, Valentina Vella.